80 pages, 8.5x11, spiral bound. Colour C$ 47.95 [ISBN 978-1-927119-65-5]. The first edition of Art Klass's Christmas Seal Ads on Canadian Post Cards was published in 2003. BNAPS was just getting into preparing and printing books from digital files and had not started printing books in full colour. With Art's encouragement and the help of many collectors, Bob Vogel prepared a second edition of the book. From his and his helpers' collections, Bob has obtained information on new cards and new varieties and also colour scans of many cards. Among the many improvements in the second edition are full colour reproduction of almost all known cards, four new card types, 39 new listings and a new decimal numbering system adopted to allow sequential insertion of new finds in the future. 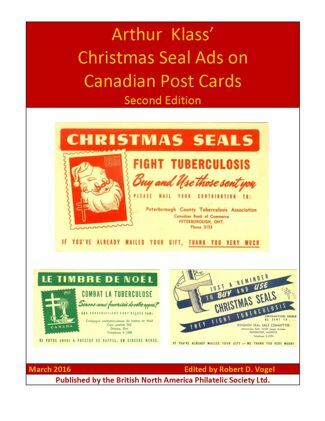 Bob Vogel was co-author of The National Christmas Seals of Canada Catalogue , first edition, with Cliff Beattie and Andrew Chung, and is a well known collector and author in the field of Canadian First Day Covers.